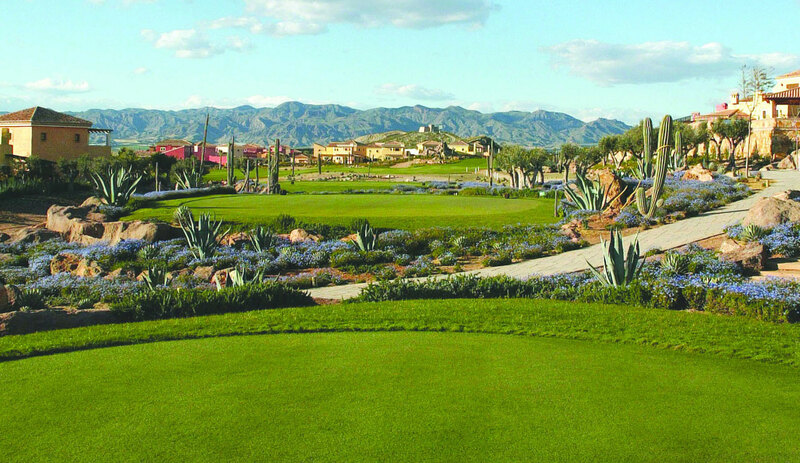 The 72 par international championship Indiana golf course was inspired by the top quality desert courses of Arizona; played thoughtfully, the Indiana can be both fun and testing, and it is always visually stunning; bright green fairways contrast vibrantly with the surrounding arid landscape of cactus, rock and flowering desert. The beauty of golf, the aspect, which separates it from other sports, lies in the variety of terrain over which it is played. While golfers enjoy golf of many types, from links to parkland, surely the world's most spectacular courses are those laid out over rugged desert landscapes. The contrast, between the beautifully prepared and manicured playing areas and the arid yet vividly coloured desert, captures the very essence of why golf stands apart from other sports. Inspired by the famous desert courses of Arizona & California, The Indiana course is the first desert course in Europe and has been built to the full USGA specifications and quality standards of these desert courses, now famous for the quality of golf that they offer. It presents unforgettable views, and golf of such a dramatic nature that it can be said to have taken not only desert golf, but also golf in general in this part of Spain to a new level of excellence. Its immaculate fairways are set amongst massive rocky outcrops, arroyos and dry rivers. The vivid contrast of the “desert springs” and the emerald green fairways with the arid landscape of cactus, rock and flowering desert, is stunning at all times of year. The whole golfing vision is framed within a panorama of landmark mountain ranges. Over 600,000 cacti and other desert plants grow progressively more dense and troubling, the further your shot is off the fairway, culminating in the dreaded “spiked lies”, so the course is both demanding and exhilarating. It offers a variety of shot making challenges to test the skill level of every player, from the beginner to professional. The quality of the course was confirmed by its selection by the English Golf Union and currently by the Welsh Ladies Golf Union, as their “Spanish Home” and also by the Royal Spanish Golf Federation, for whom Desert Springs hosted the 2004 Spanish Amateur Open and will be hosting the 2007 Open. Its Academy of Golf provides practice facilities, second to none, for National squad and County Union members. Beside the Standard Green Fee and Buggy Hire rates, please see the PDF below for our special offers available such as the "Early Bird" as well as the "Cactus Combo" rounds. 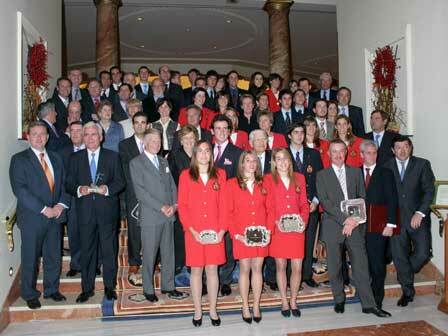 Socio-Cultural Activities and The Royal Spanish Golf Federation, out of no less than 60 entries for the award. The objective of the award is to both recognise and to publicise the many positive aspects of environmental conservation that can be achieved by the voluntary efforts and work of those involved in promoting, running and managing golf courses, providing they act with all due regard, respect and care for environmental issues. The Awards Committee highlighted the tremendous response to the awards received from Spanish golf courses; some 60 courses entering the competition for the award, demonstrating in itself a high degree of environmental awareness and concern in the golfing industry. Following assessment of all sixty by the Technical Committee, seven were selected for the short list, being Desert Springs, La Herrería, Montanya, El Saler, Los Arqueros, Buenavista & RSHEECC. "In Desert Springs case, the scrupulous work that was carried out during the construction of the course in a desert environment was evident, an extraordinary and exceptional case of respect for the natural environment. Special mention is to be made in respect of the careful use of water in a closed circuit system of irrigation, allowing for the correct minimum necessary consumption, based on systems typical of those used in Arizona USA. It should also be mentioned that Desert Springs do not irrigate the 'rough' area of the course, only the tees, fairways and greens, and this encourages the growth and well being of the local flora and fauna." Director of Golf, Simon Coaker commented - “The world of golf has a responsibility to both respect and enhance the environment in which it resides and it is wonderful to have the efforts of all involved, in particular those of our Golf Course Superintendent, Anthony Brooks, and Chief Naturalist, Joel Lodè, recognised. Furthermore, I believe that this award can only be positive for the future of golf course development in our area”.